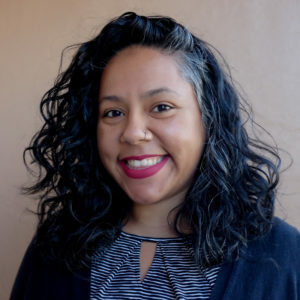 Candy Guinea joined the Family Equality communications team as a Digital Marketing Coordinator in April 2019. Candy has extensive experience in social media management, digital media and documentary filmmaking. She received her M.F.A. in Cinema from San Francisco State University and her B.A. in Feminist Studies from UC Santa Cruz. Her personal work as a documentary filmmaker focuses on amplifying the varied and complex stories of queer communities of color and queer parents of color. Originally from the San Francisco Bay Area, she now resides in Sacramento with her wife and their joyful toddler.